In the lead-up to the National People’s Congress (NPC) starting on Saturday, the Chinese government has announced massive layoffs in state-owned enterprises in coal and steel. Further sackings in other basic industries are being foreshadowed in moves that will result in millions of workers losing their jobs and heightened political and social tensions. The Chinese Communist Party (CCP) leadership has delayed taking steps to deal with huge overcapacities in heavy industry and so-called zombie companies—state-owned enterprises (SOEs) kept on life support via low-interest bank loans—for fear of triggering widespread social unrest. However, amid a slowing economy and concerns about mounting debt, the regime has signalled a swathe of sackings. Premier Li Keqiang told top economic advisers in December: “We must summon our determination and set to work. For those ‘zombie enterprises’ with absolute overcapacity, we must ruthlessly bring down the knife.” Li will present his yearly work report to the NPC which will also deliberate on the 13th Five-Year Plan that sets the economic guidelines for the government. On Monday, the employment and welfare minister Yin Weimin announced that capacity in the coal and steel industries would be drastically reduced with 1.8 million workers losing their jobs—1.3 million coal miners and 500,000 steel workers. The figure was a sharp increase from just a few days before when industry minister Miao Wei declared that one million jobs would go in coal and steel. A Reuters report on Tuesday based on unnamed government sources indicated that the government is planning to slash capacity in as many as seven sectors, including cement, glassmaking and ship building leading to around six million jobs being destroyed in the next three years. The emergence of huge overcapacities in China’s basic industries is intimately bound up with the continuing worldwide economic slump that has followed the 2008-09 global financial crisis. The CCP leadership reacted to the collapse of exports and the loss of 20 million jobs with massive stimulus packages and a flood of cheap credit that fuelled a speculative property bubble. Like governments around the world, Beijing calculated that the crisis was temporary and export growth would resume once the major capitalist economies recovered. Basic industry expanded, spurred on by infrastructure projects, construction and a continuous supply of cheap credit. However, export markets have stagnated, property and infrastructure investment is slowing and the much vaunted “transition” to a service economy has failed to prop up growth rates. The slowing Chinese economy, now the world’s second largest, is already reverberating internationally. Falling Chinese demand for basic industrial inputs has contributed to the collapse in world commodity prices which is now severely impacting on commodity exporting countries such as Brazil, Russia, South Africa, Australia and Canada. The excess capacities in China are enormous. Estimated steel overcapacity jumped from 132 million tonnes per year in 2008 to 327 million tonnes in 2014—a figure that is more than three times greater than the total output of Japan, the world’s second largest producer. Over the same period, overcapacity for cement nearly doubled from 450 to 850 million tonnes, for oil refining leapt from 77 to 230 million tonnes and for flat glass jumped from 76 million to 215 million weight cases. According to the Financial Times, 42 percent of all SOEs lost money in 2013. Total profits for such groups fell in absolute terms last year for the first time since 2001. The gap in return on assets between SOEs and private firms is now the largest in two decades. Government intervention to slash overcapacity could place further stresses on the financial and banking system as SOEs account for an estimated 50 percent of all commercial debt. Already there are deep concerns about mounting bad loans. A report last month by the European Chamber of Commerce in China stated that non-performing loans (NPLs) had risen by $US76 billion during the first ten months of 2015 to about $291 billion, a 35 percent increase. The Chinese government’s plans to slash overcapacities and jobs will hit some areas of the country much harder than others, exacerbating regional tensions. Provincial and local governments have often kept “zombie” SOEs afloat through the provision of loans so as to avoid mass layoffs and rising social unrest. The so-called rust-bucket region in the northeast of the country where unemployment is already high will be particularly badly affected. Many of those who lose their jobs will simply not find work elsewhere. 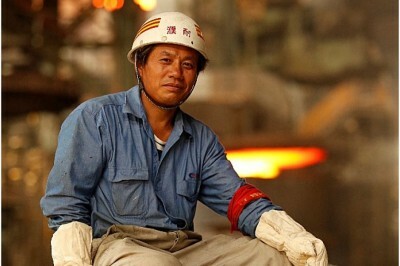 In January, China International Capital Corp (CIIC), the country’s largest merchant bank, predicted that 30 percent of the 10 million people employed in the coal, steel, electrolytic aluminium, cement and glass industries would lose their jobs in the next two years. The CIIC report concluded that a million of these workers would not find a new job. That estimation was based on the results of the last round of mass job losses in SOEs in the late 1990s when 21 million workers were sacked. Only two thirds found work or were transferred to other jobs. China’s growth rate in the 2000s, however, averaged 10 percent and peaked at over 14 percent in 2007. Now, however, it is officially 6.9 percent and slowing. Jobs are being destroyed not only in heavy industry but also in the manufacturing export sectors. The official unemployment rate is 4 percent but some estimates, such as research by the National Bureau of Economic Research, put the real figure at close to 10 percent. The Business Insider last week reported that millions of migrant workers were returning after the New Year break to an uncertain future, “as smaller factories in particular struggle to cope with anemic orders and rising inventories.” Exports from Guangdong province, one of China’s major manufacturing hubs, are predicted to grow by just 1 percent this year. There are already signs of growing opposition among workers to plans for mass retrenchments. Figures produced by the Hong Kong-based China Labour Bulletin have shown a sharp rise in the number of strikes for 2015 to 2,774, twice as many as for 2014. In January, 504 strikes were recorded. The statistics are only a partial record as they rely on media and social media reports as well as local contacts.